Repurposing content refers to the action of taking a piece of existing content and then changing it so it can serve a different purpose. Some people may say that repurposing content is similar to revamping content. However, this is not true. The difference between the two will determine how the content is used and how it will benefit the marketing strategy of the business. This covers doing one or two things or doing both at the same time. When the format of a piece of content is changed or when the target audience is different. An example of changing the content: take a series in a blog, make some changes and then put them all together in the form of an eBook. Alternatively, take information that disseminated in a video and then use the key elements of the video to come up with an infographic. An example of changing the target audience: Take a piece of content that was aimed at small business owners, and then make significant changes to target it at bloggers or social media marketers. This covers making changes and updating a piece of content to continue serving the same purpose that it originally served. An example of revamping content: Take an old piece of content that showed how a business could get more reach on Facebook, and then update it to include the recent strategies implemented in Facebook marketing and then repost it. The layout, images, etc., can be altered to make it appeal to today’s readers. The “marketing funnel” or “buyer’s journey” is the process through which potential customers go through before they can decide to buy. This journey has three stages – awareness, consideration, decision to buy. The repurposed content can be used to influence the buyer’s frame of mind at each of these steps. These stages will vary slightly depending on the niche, but the fundamentals are the same. People at the awareness stages are looking for interesting information or “snacks” that will grab their attention. People in the decision stage will be evaluating the business and its competitors so that the content can be repurposed accordingly. Each stage of the marketing funnel will require a change in the angle and format, to align it with the way the leads consume information at that point. A blog post or infographic lightly talking about Facebook marketing will be targeting leads at the awareness stage. The blog post or infographic can then be fleshed out into an eBook, which will show them how the product or service described in the content will help them maximise their Facebook marketing effort – This will be great for content at the consideration stage. Businesses have different buyer personas, which can be described as people who fit various aspects of the business. Content can be repurposed so that it is relevant to each type of buyer persona in the business. Consider another persona that likes simplified information. Take the same infographic and then turn it into an explanatory video or a SlideShare presentation. Repurposing content can target the buyer personas and the marketing funnel at the same time. This kind of content can be viewed just as a matrix. 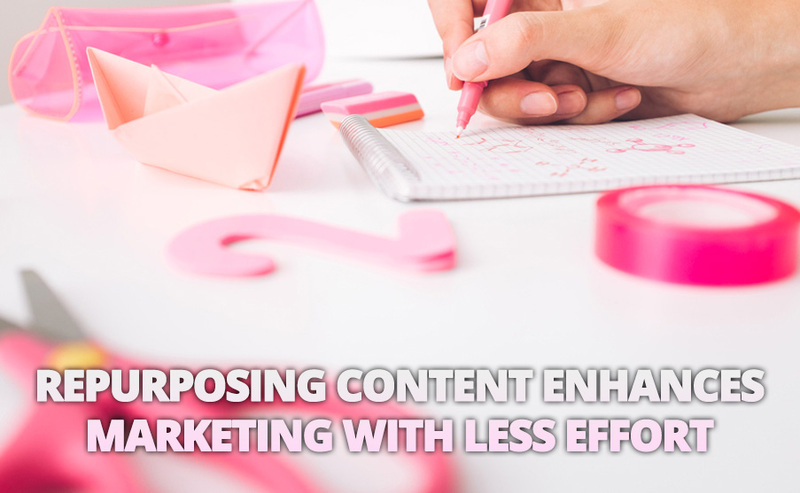 An example of repurposing content for multiple purposes: Take some content that has been doing very well at one stage of the marketing funnel and then repurposes it to target a particular buyer persona in that particular stage in the marketing funnel. Why is this considered easy content creation? Repurposing content requires less effort and research when it comes to the creation part of it. The topic and purpose of the content are easier to structure than creating the content fresh. Repurposing content is a great way of streamlining a business marketing strategy. It is a way which allows targeting different people at various stages in the buyer’s journey. The repurposed content will help people make informed decisions faster, earning the business a lot of mileage regarding trust and satisfaction. Each buyer is well informed according to the content he or she consumes and as the buyer’s journey progresses the buyer will make an informed decision, leading to better trust and satisfaction with the product or service. When Do Videos Work For Your Campaign? Is eBay’s Affiliate Program Worthwhile or Is It Risky? We’re always glad to accept guest posts here at IndianAffiliatePrograms, especially if they are topics of value to our readers. If you have an idea for a guest post, please click on the below “Submit a post” button for submitting a new post. © 2017 IndianAffiliatePrograms.com. All Rights Reserved.